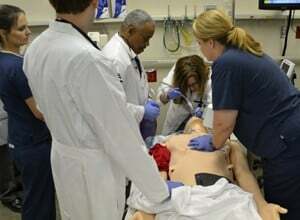 Sydney Speight, M.D., center, with intubation tube, is assisted in the resuscitation of a simulated patient by Perry Dejarnette, respiratory therapist, immediate left, and Amy Niemann, R.N., right. Nicole Mullings, R.N., is far left. UAMS Chancellor Dan Rahn, M.D., speaks during the Simulation Center opening ceremony as Mary Cantrell, center director, and Mike Wallace, center manager, look on. Peter Leake (left), playing the role of husband to the expectant simulated patient, and Julie Warner, R.N., wait for the delivery to begin. 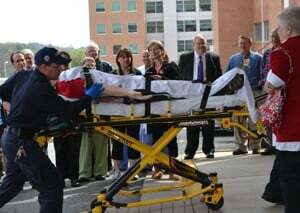 A simulated patient is rushed from an ambulance to the Simulation Center at the conclusion of the opening ceremony for a training demonstration inside. March 31, 2011 | The state’s only comprehensive adult medical Simulation Center with computerized, life-like manikins for hands-on training of students, faculty and staff opened today at the University of Arkansas for Medical Sciences (UAMS).